If you’re building your dream home in McKinney, Texas, you’re probably facing a number of big decisions. One thing to consider as you go through the construction process is how your HVAC system will maintain indoor comfort. Building a new structure gives you more options when it comes to optimizing the indoor environment. Starting from scratch in the construction process gives you access to additional innovative equipment options in the HVAC industry. When you’re working with an existing building, you’re limited in choices that will fit in the space. With a custom build, you can work with the HVAC contractor to determine what innovative options you want in your home, whether that’s utilizing ductless units, or a smart thermostat that provides more control or a multi-speed air conditioning system that can operate more efficiently while maximizing comfort. 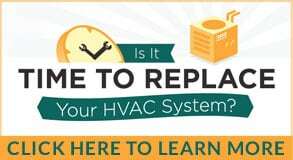 Newer HVAC units are more efficient than outdated models, so the installation of a new system will help keep your utility bills under control. As you compare options during the construction process, talk to your HVAC contractor about efficiency ratings and whether any rebates are available on specific units. When your system operates more efficiently, it uses less energy while providing a comfortable atmosphere. New, clean ducts allow air to flow through them efficiently. Over time, the air pulled into your system will contain dirt, dust, pollen, pet hair, dander, and other contaminants that settle in the ducts and reduce efficiency. Keep up with a regular air duct cleaning schedule to maintain healthy indoor air. A custom HVAC system that is built to fit into your new home can also provide a more comfortable atmosphere. For example, in a two-story home, one of the most common complaints is a drastic difference in the temperature between the two levels. Your HVAC contractor can discuss options like ductless systems or zoned areas to maintain a more comfortable temperature and atmosphere in your home. Contact our team of professionals at Bill Joplin’s Air Conditioning & Heating to discuss HVAC options for your new home by calling 888-414-4655. Building a new structure gives you more options when it comes to optimizing the indoor environment.